Acoustic Noise Barriers have been developed to reduce noise pollution on construction and event sites. The Acoustic Noise Barriers are used to screen off noise and can be fitted quickly on site to our fencing panels. Providing a safe environment for your construction or event site, the noise reducing acoustic barriers also helps to demonstrate your commitment to corporate social responsibility by using a product that helps to combat noise pollution. Fast and simple ‘one man’ installation. Extends site operating hours. Independent testing has shown that the noise reducing acoustic barriers can deliver up to 30dB noise reduction and is great for city centre construction and event sites. When noise is generated on site, the noise reducing acoustic barrier’s membrane will absorb noise and reduce the degree of noise pollution. Independent testing has shown that the noise reducing acoustic barriers can deliver up to a 30dB noise reduction. The Acoustic Noise Barriers can be attached to a fence panel with 3 per panel via hooks and bungee cords. 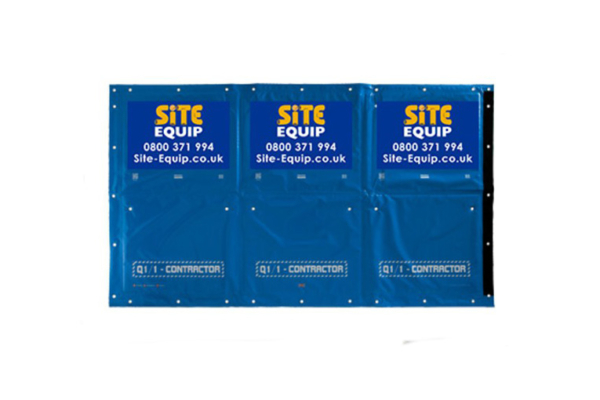 Site Equip are able to deliver these sound reducing panels across the South of England with next day delivery.